The found footage film SOLITAIRE is made from documentary film material of the late 1950s until 1972 from the archive of Hessian Rundfunk. We see Max Horkheimer buying newspapers, we hear Hannah Arendt talking about the mother tongue. We also see Frankfurt during the great construction boom of the sixties. 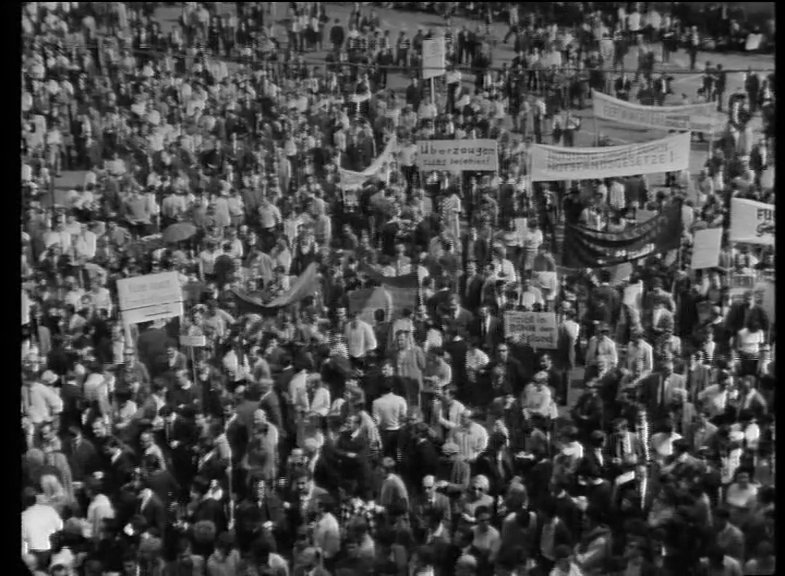 We see demonstrations on the Römerberg and the presence of the Americans in the Federal Republic during the cold war. Housing shortages, urban development, youth, guest workers, consumer society: these topics are repeatedly seen in the Hessen Schau from these decades. Laura J Padgett has complied a film that deals with the concept of democracy and having a voice and the contiguity between private and public space. These boundaries, which are in the process of dissolving, are made clear by cinematic history and the idea of news reporting as fundamental strands of our social network. C. Hüls, N.Lettenewitsch, A. Zechner, Eds.